More than anything else, we are diving enthusiasts that love the sport and love to spend time with others who get a thrill out of diving. We aim to create exciting underwater experiences for divers of all levels, including those who would like to begin this wonderful activity, in complete safety while also promoting marine conservation. We are "Down-to-Earth people" who would like to maintain friendships with our customers who go through our training. Our primary desire is to transmit our enthusiasm for and love of this beautiful island and its characteristic seas to all those who decide to visit us. Paolo, 49 years old, born in Turin, northern Italy and a diver since the age of 14. 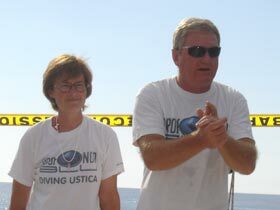 Having already dived in many different seas around the world, he visited Ustica by pure chance in 1985 with Ann, a lady from Belgium who he had recently met on a previous trip to the Comoros Islands in the tropics. 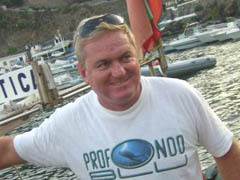 Paolo fell in love with the island of Ustica and its seabed at first sight! Now married to Ann and with two grown up children, Giovanni and Gaia, Paolo and his family have been living permanently on Ustica since 2000. To date he has completed around 5,000 dives, 2,000 of which in the seas around Ustica and probably knows every rock and crevice on the sea floor for ten miles in all directions. He speaks fluent English and French, not much of the dialect from his home town, but is picking up Sicilian quite nicely. 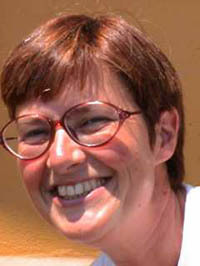 Ann, 47 years old, biologist, instructor and scuba guide. She has been diving since 1985 and has completed over 2,000 dives to date in various seas around the world. Originally from Belgium she also speaks Italian, French and English fluently but is still having the odd problem with the Sicilian dialect! Like Paolo, Ann also has extensive knowledge of the wide variety of dive sites around the island which she has been exploring since 1985.